2015 is an exciting year for Canoeing Ireland and we are pleased to announce our Kayak Instructor Training Initiative which starts 24th February. We will be working with five youth groups from disadvantaged areas. We have created a programme that involves long term engagement of young people in a formal and non formal setting. We will deliver local kayak instructor training initiative programmes. We will build a working relationship with five or more youth services for this Initiative. To take 8 young people from each programme, selected through an interview process. We will aim to empower young people to become activity leaders. We are offering a professional qualification that opens pathways to employment and further education. 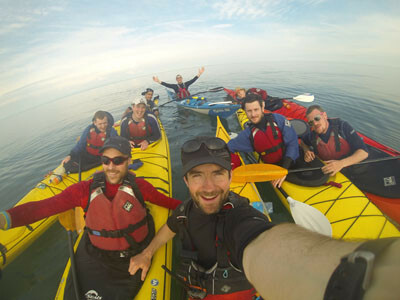 There will be an Irish Sea Kayak Crossing Challenge. To train 40 young people to become Level 1 Kayak Instructors. Change forty young people’s lives over nine months. Transform communities by training local activity leaders with professional qualifications. The legacy of the project will last for years in local communities. Mobilisation of young people in the community through local youth services. Lifelong involvement in the sport as instructors. Potential of mobilizing thousands of individuals through canoeing activity for years to come. Run static site introductory kayaking sessions on flat water with groups of up to 6 students. Train and assess for the Canoeing Ireland Level 1 Kayak Skills Award. St Monica’s Youth Resource Centre. Dublin City Council Sports officers have also put forward ten young people from the area of Ballyfermot. Canoeing Ireland are still looking for two youth services nationally to get involved in the project. If you are interested please call Daniel on 0857200198 or email paddlesessions@canoe.ie to request more information. Canoeing Ireland have been awarded a grant from Coca Cola Thank You Fund to the amount of €25000 to promote this active lifestyle project. Therefore we are offering this project at a vastly reduced rate in order to make it possible for Youth Services to become involved. This is a great opportunity for any youth service and young person to get involved. Outdoor Learning is widely used as a tool to contribute to youth work. There are many benefits of using outdoor learning in the youth work process such as leadership skills, decision making, problem solving, self-esteem and critical thinking. The initiative aims to empower the young people and to equip them with the skills and knowledge to become active participants within their community. The initiative creates a space for formal and more importantly non-formal learning where young people can develop socially and personally. Through continuous engagement with the programme, Canoeing Ireland believes that transformations will take place within the young people where they can realise their potential and make positive decisions that will affect their lives.